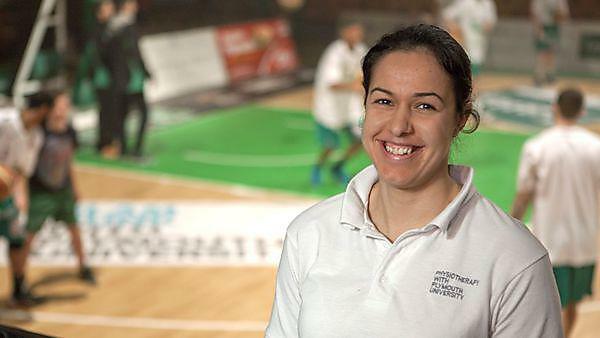 Kiah Rosenstein, physiotherapist for Plymouth Raiders Basketball team. Why did you choose to go into a sport related career? I have always been a sports fanatic. Sport was the main reason why I wanted to become a physiotherapist. I experienced many injuries during my sporting career and physio’s helped me both mentally and physically. I want to help others achieve their physical potential and be the best they can be. This has been a very rewarding career and given me great personal satisfaction. Sport jobs are rare especially with minimal experience so this opportunity has allowed me to gain hands on experience in the sports setting. My favourite part of the job is working closely with a professional team alongside coaches and players on a daily basis; using my skills to help the team perform to their maximum potential. Working closely with managers, strength and conditioning coaches, sports therapists and doctors, has outlined the importance of teamwork and communication skills. I work autonomously as the only physiotherapist within the club, so prioritisation and delegating is very important. Having students shadowing me during games has given me supervisory experience and allowed me to pass on my skills. I’ve assessed and treated many acute injuries and provided rehabilitation programmes, undertaken manual techniques and implemented injury prevention strategies. By providing pitch side cover on game days, it has given me experience of managing injuries in stressful situations. Advice for students interested in following a similar career path? Get as much experience as possible, either by volunteering at weekends/evenings or getting paid work. Be proactive and get as many contacts as possible. Sport jobs are hard to come by, especially when first qualifying, so you need to stand out from other candidates. Putting in extra hours (most of the time unpaid) will be rewarding in the end. I’ve made the most of all my opportunities: shadowed many physios’ in many different sports and at different levels, gaining experience and contacts. Once qualified I would also encourage graduates to do extra courses that are sport specific and to consider joining the ACPSM as it provides advice for physiotherapists wanting to get into sport and a CPD pathway to follow.